Virgin and child. The Book of Kells. Trinity College, Dublin. ca. 800 AD. This illustration is the oldest extant depiction of the Virgin Mary in a Western manuscript. The Book of Kells, also known as The Book of Columba, is an illuminated manuscript containing the Four Gospels (Matthew, Mark, Luke and John) in Latin. It is a masterwork of Western calligraphy and insular illustration. Insular art (insula/island) refers to both script and illustration and was a style unique to Britain and Ireland, originating out of Irish monasticism. The famous manuscript derives its name from the Abbey of Kells. First founded by St. Columba in 554 AD, the abbey became a refuge for monks fleeing the Viking raids of Iona. It is possible that the monks began the transcription of the Book of Kells in Iona and completed it at the Abbey of Kells several generations later. Viking raids continued at the Abbey of Kells and in 1006 the Book of Kells was stolen. Two months later the abbey recovered the manuscript, now missing its front and back covers and the beginning and ending illustrations. Since 1953 The Book of Kells has been bound in four volumes. 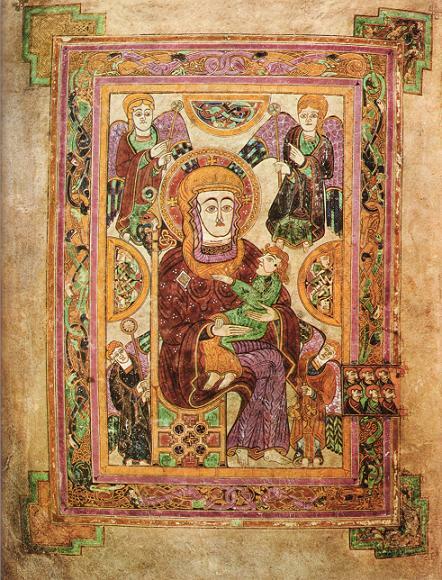 It is on permanent display at the Trinity College Library of Dublin and considered Ireland's finest national treasure.